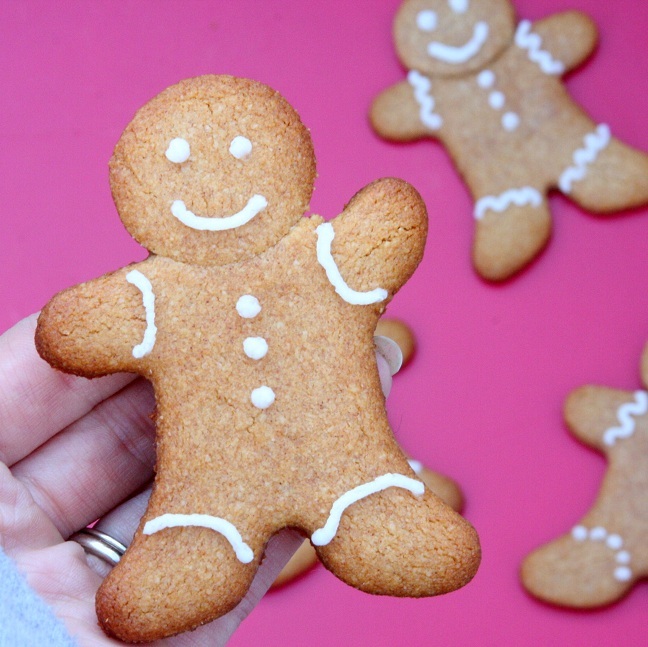 Gingerbread cookies are a classic holiday cookie and are a must to any cookie platter. 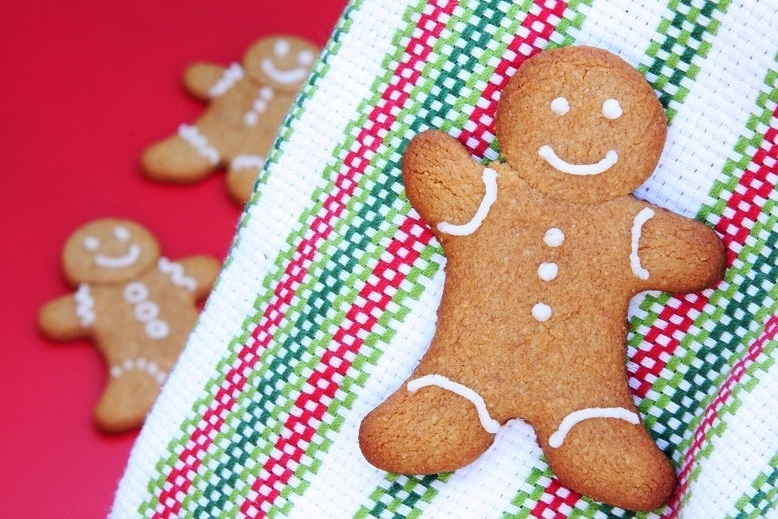 This gluten free gingerbread recipe is flavorful and stable. Use any of your favorite cookie cutters. I like to make little gingerbread men, however decorated snowflakes or stars are beautiful. A stress and mess free way to roll out cookie dough is to use plastic wrap or parchment paper. Simply place the chilled dough between two pieces of plastic wrap and roll out the dough with your rolling pin. So easy and clean up is a cinch! Whisk together melted butter and honey. Chill dough for at least 1 hr. 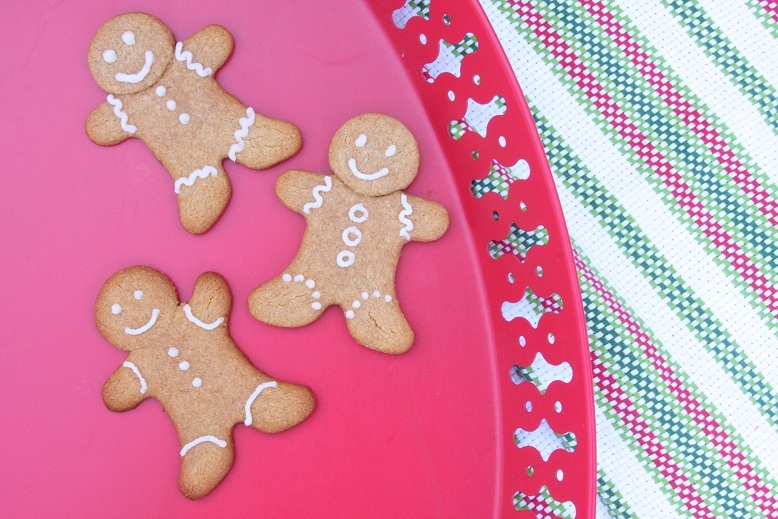 Roll out the dough and make shapes with cookie cutters. Place on lined cookie sheets and bake for 8-10 minutes, until golden brown. Whisk together the coconut oil and honey until smooth. Then to thicken, simple place over an ice bath (bowl with a little bit of ice and water) And whisk simultaneously until the mixture thickens into a smooth and creamy frosting. Place frosting in a ziplock bag and snip the corner with scissors. So a few notes on this frosting… it’s not perfect. As you know, coconut oil starts to liquefy at 76 degrees. So these cookies need to be stored in the fridge or a cool spot and not brought to a warm place :/…. If these conditions don’t work for you, then simply use another royal icing recipe that better suits you! For example, if you live close to the equator, this would probably be a tragic disaster… For me this is perfect, a healthier option that is stable enough… we live in MD, so it’s not going anywhere near the 70′s! And I keep my house at 68, so we’re good. My kids really enjoyed the nice light flavor of the frosting, which compliments the gingerbread nicely. Guess where we found Bobby today?? 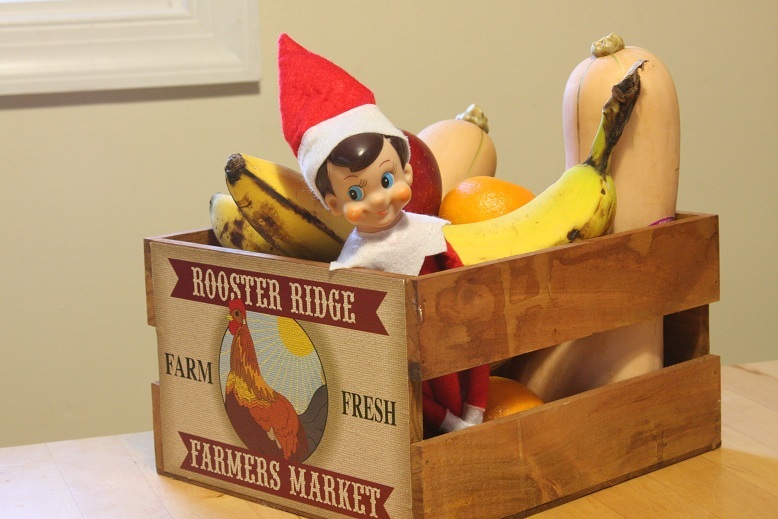 In the fruitbowl… silly Bobby. These look fantastic! I will try making them at Christmas! Just want to say these are the best tasting gingerbread cookies Ive ever had! Thank you so much for the recipe!! I tried to make these cookies the other week and I had a really hard time using the cookie cutter. I left my dough in the fridge like you said… but by the time I rolled the dough out and used the cookie cutter to cut out a shape, i wasn’t able to pick up the dough. It had softened too much! How are you doing it so that the dough stays hard long enough to cut the shapes and transfer onto a cookie sheet? Hi Kayla! I work with the dough quickly (probably faster than most), but have noticed towards the end it does get rather soft. The best solution is to work the dough in small batches and keep the rest in the fridge. Maybe try working with 1/4 of the dough at a time. Let me know if this helps.